My Disability Is Invisible. I’m Still Disabled. After falling out of a tree, I experienced a traumatic brain injury that affected nearly every aspect of my life. So why is it so hard for even friends and family to believe I'm disabled? Not long ago, an old friend and I were catching up at the coffee house we both used to work at. 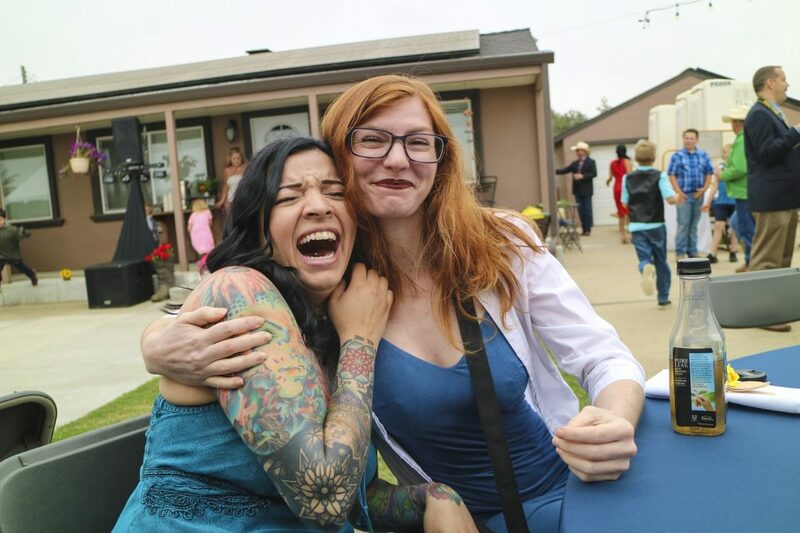 I had entered a Master’s program in Boston the previous year and was visiting San Diego to see friends and family. I ordered an ice tea and asked the barista if they wouldn’t mind setting it at the counter where we were seated. After sustaining a traumatic brain injury (TBI) a few years ago, I have trouble carrying any kind of liquid without sloshing it. “Y’know, brain damage,” I casually mentioned to my friend by way of explanation; he knew about my accident and balance issues. “You use that as an excuse a lot,” he carelessly replied, as if I had just said for the millionth time that a dog ate my homework. Except it’s not an excuse. I might look uninjured, and mostly act uninjured, but it is an unequivocal fact that I have brain damage. Since my traumatic brain injury, I’ve suffered from ataxia and poor fine motor skills. Carrying a glass of liquid without spilling it has become a pipedream; writing anything by hand is painful. So how is it that even my friends, the people closest to me who know what I went through, could categorize that as just an ‘excuse’? It’s not an excuse. I might look uninjured, and mostly act uninjured, but it is an unequivocal fact that I have brain damage. The answer, of course, is because the brain is locked away inside your skull, and it’s hidden from sight until it’s quite obviously not working right. And since my brain damage mostly exhibits itself in subtle ways, it’s easier for even smart people to brush off my trauma as an ‘excuse’ than to put themselves in my shoes. But none of that makes me any less disabled, even if it took me a while to accept that fact myself. Throughout the majority of my life, I was proud of how I communicated. There’s an ironically unspoken premium placed on the ability to communicate in our daily lives. We take for granted our own ability to talk — how easily we can improvise a sentence. Or, at least, I did, until it was taken from me. From a young age, I loved to read, even annotating books to tease out their meaning. I was a natural critic: I never had a problem explaining why I thought the way I did about a book. As a military brat, books were my constant friend; I’d take them up into trees in the backyard of whatever new home we’d move to, and while the day away, perched on a branch, devouring a novel in the shade. I never stopped reading, and I never stopped climbing trees. When I grew up, I went off to the University of California, Santa Cruz’s campus (full of redwoods) to study literature. And it was there, while climbing redwoods near campus with friends, that I experienced my traumatic brain injury, after my chronically low blood pressure caused me to faint and drop to the ground from the height of 20 feet. 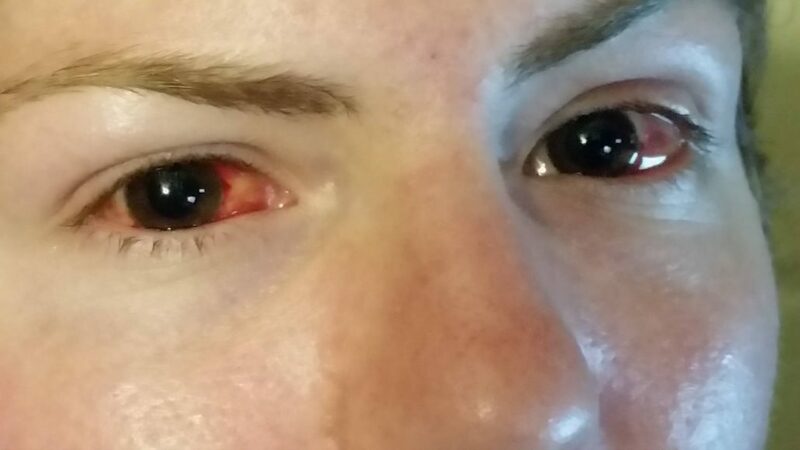 A close-up of the author’s eyes after surgery. And it was there, while climbing redwoods near campus with friends, that I experienced my traumatic brain injury, after my chronically low blood pressure caused me to faint and drop to the ground from the height of 20 feet. I ended up in a 10-day coma. After I woke up, the doctors told me I’d experienced a traumatic brain injury, with all of the complications therein. Over the next six months, I relearned how to walk (albeit with regular balance issues that persist to this day) and overcome a paralyzed vocal cord. Meanwhile, damage to my occipital lobe caused diplopia (double-vision) that was fixed with an eye muscle surgery nine months after my accident. Eventually, though, the symptoms of my brain damage faded away. They never quite disappeared, but they became easy to overlook, even if my brain itself was still damaged and healing. For example, if more than one person spoke at the same time, I couldn’t understand what was being said. If someone’s phone rang, it scrambled my thoughts and made it hard for me to keep my balance or walk. I was still literally and figuratively unbalanced… but people didn’t really notice anymore. “I feel like Harrison Bergeron, that Kurt Vonnegut character that has his thinking interrupted with loud noises pumped into his head,” I once told my boyfriend; he looked at me blankly, and suggested we go to a bar, oblivious to the fact that cacophony was the last thing I needed. Plus, dodging stools in dim lighting with my balance issues? Yeah, no thanks. 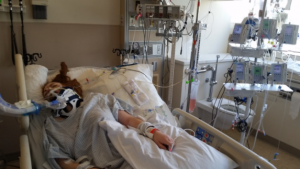 The author in her hospital bed during her 10-day coma. Besides walking and disruption from sounds, I often struggled to find words and found myself tongue-tied. I’d mean to say one thing, and say the other, or else smash together two unrelated words into a nonsensical portmanteauPeople corrected me all the time, and if I struggled or stuttered mid-sentence, they’d attempt to finish my sentences for me… often incorrectly For someone who prided herself on her ability of self-expression, my aphasia mortified me. There are other symptoms too. Because of my balance issues, I now get chronically car sick, and can no longer legally drive. The abilities I do have take a nosedive if I don’t get a full eight hours of sleep, including my balance and spatial awareness. Even so, the closest people to me regularly forget that I have a brain injury. For example, during a road trip to San Diego with my mom in which I was playing navigator, I once forgot the word ‘left’ when she asked me which way she needed to exit the freeway. Instead, I stuttered and frantically pointed where she should go. “I can’t look at you when I’m driving,” my mother snapped. “If you can’t give me directions you can’t sit up front and you’ll just have to sit in the back and be sick.” At the end of the day, she would find where we were going and forget about the difficulties of getting there; a year later, I’d still remember that car ride and the burning shame I felt after. Why is it so hard for others to accept that I am disabled? Perhaps it is partially because I have had trouble accepting it myself. For years, laughing at my shortcomings and saying I was ‘brain damaged’ was my way of flippantly avoiding the hard truth that I am disabled, and this is my life now. You can’t expect other people to accept your disability if you can’t accept it yourself. Now, entering my fourth year of recovery, I can admit with conviction I’m disabled. But my friends and family still often act skeptical, telling me I don’t look disabled, as if every disabled person looks similarly. These days, when someone doubts my disability, it’s easier for me to show them my subway pass with the handicap symbol in the corner than try and convince them. Even people close to you can sometimes forget you’re disabled if you don’t advocate for yourself. Because if there’s anything I’ve learned from all this, it’s that you can’t advocate for yourself if you’re living in denial about the ways in which your life and abilities have changed. After all, you can’t expect other people to accept your disability if you can’t accept it yourself. https://folks.pillpack.com/wp-content/uploads/2018/07/Knisley-June-2018.jpg 1066 1600 Brooke Knisley https://folks.pillpack.com/wpinhere/wp-content/uploads/2017/03/folks-logo-1.png Brooke Knisley2018-07-25 12:06:042019-01-22 11:58:55My Disability Is Invisible. I'm Still Disabled. As veterans have returned from two major post-9/11 conflicts in Iraq and Afghanistan, neurologist and researcher Dr. Dawn McGuire has cared for them. She has also long studied the types of traumatic injuries, including brain trauma, most commonly associated with combat veterans, and the impact of those chronic conditions on their acclimation back into everyday life. In addition to her work as a researcher and physician, McGuire is also an award-winning poet who draws inspiration from her clinical studies and her patients. Her work emerges from a rich if relatively recent tradition of narrative medicine, in which physicians and caretakers learn and practice the inextricable links between caring for the sick or injured, and telling stories about health, illness, and wellness. In her latest collection, American Dream with Exit Wound, published in early 2017 by independent publisher IF SF in San Francisco, she explores themes of hazardous materials and bodies as battlegrounds for soldiers returning home, and how, for returning vets, every day can continue to be war. “I use my poems as an act of imagination, to help myself cross the gap into their lives, to be of real use,” McGuire says of how she uses writing to further access the emotions necessary to her work as a clinician. Her previous collection, The Aphasia Café, which was also published by IF SF and won the 2013 Next Generation Indie Book Award for poetry, similarly explored issues of self-identity, shame and redemption. Celebrated for her work rendering post-combat healing as poetic verse, McGuire will be reading from American Dream with Exit Wound at the 2017 Los Angeles Times Festival of Books in April. She shared more about her work—her caregiving, as well as her writing—with Folks. How did you come to work with veterans returning from Iraq and Afghanistan? I’m a neurologist and researcher. I first started to see vets in my early training at the University of California, San Francisco, at the San Francisco Veterans Administration hospital. After 9/11, I became involved in traumatic brain injury (TBI) research and began to see vets who were referred to my free clinic for complex neurological problems—typically brain injury with post traumatic stress disorder (PTSD) and often addiction. They needed more attention than was possible in the medicine-as-business model. I support myself with research, so I have the blessing of being able to practice medicine without insurer [and other related] constraints. What do you think those who don’t know veterans personally or aren’t personally impacted by these wars misunderstand about the servicemen and –women returning from battles overseas? It’s easy to misunderstand silent suffering. Who really lives in their world once they return? Their squads are scattered, and they are expected to assimilate immediately back into a culture for which they have sacrificed more than their bodies. It’s easy to misunderstand silent suffering. Who really lives in their world once they return? They also sacrificed, in many instances, the core values and principles they were raised with. They may have committed acts that would be moral atrocities in a civilian context. There is little or no appreciation of the psychic splits that occur because of this, the disintegration of the sense of self. There needs to be, as a given, counseling, training, and ritual—as there was in boot camp to create the warrior mentality. There needs to be a boot camp for their restoration and re-creation, run by healers. There’s such a rich tradition of medical professionals and healthcare workers—everyone from Walt Whitman to Atul Gawande—writing about their work, their patients, and their perspectives on health, healing, and wellness. Who has inspired your work, and in what ways? 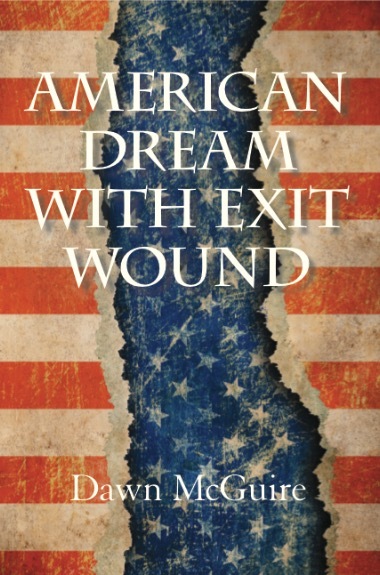 The cover to McGuire’s latest poetry collection, American Dream With Exit Wound. I went to medical school at Columbia University, the birthplace of narrative medicine (albeit a decade after I graduated). But of course, the atmosphere that enabled Dr. Rita Charon to found the first program in narrative medicine was already in place when I was there. Personal involvement, and striving to empower compassionate care, were rewarded. The other visionary of narrative medicine is Dr. Rachel Remen, at UCSF, where I trained in neurology after Columbia. So it has been the validation of my practice, against the grain of medicine-as-business, that has inspired and empowered me. 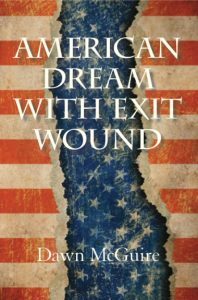 Is there a specific poem in American Dream with Exit Wound that has an especially evocative backstory? About a third of the collection has to do with vets, addiction, or both. I don’t have any identifying details in my poems to protect patients whose backstories may have gotten me writing. The most powerful, to me, is the title poem, in which the iconic ancient warrior Achilles is a junkie. His hyper vigilant lover is looking for signs that he is using, as any addict’s loved ones tend, painfully, to do. In your last poetry collection, The Aphasia Café, you wrote about a different sort of symptom set and how that condition manifests in the mind and body. How did writing about war wounds and PTSD differ, but also, how do you see the two as similar? The Aphasia Café had many poems concerned with the breakdown of language as a symbol system, after stroke, for example. American Dream with Exit Wound deals with another kind of language disruption. Physical and emotional pain defy language, defeat it. The vets I see speak in monotones and monosyllables. Besides medical treatment for their neurological problems, I try to make a space in which their stories, in their multiple dimensions, can be conveyed and, in the best outcome, their sense of agency restored. It takes time and trust. It’s in the literature of vets themselves, their own stories, that I believe there is the greatest hope. What gives you hope when caring for this generation of veterans? In the same vein, how do you view the role of literature in providing hope? It’s in the literature of vets themselves, their own stories, that I believe there is the greatest hope. Narrative is strong medicine for these complex and marginalized soldiers. It can break into silence, [what I call] their solitary confinement. It can make real connection imaginable again. Buy a copy of American Dream With Exit Wound here.